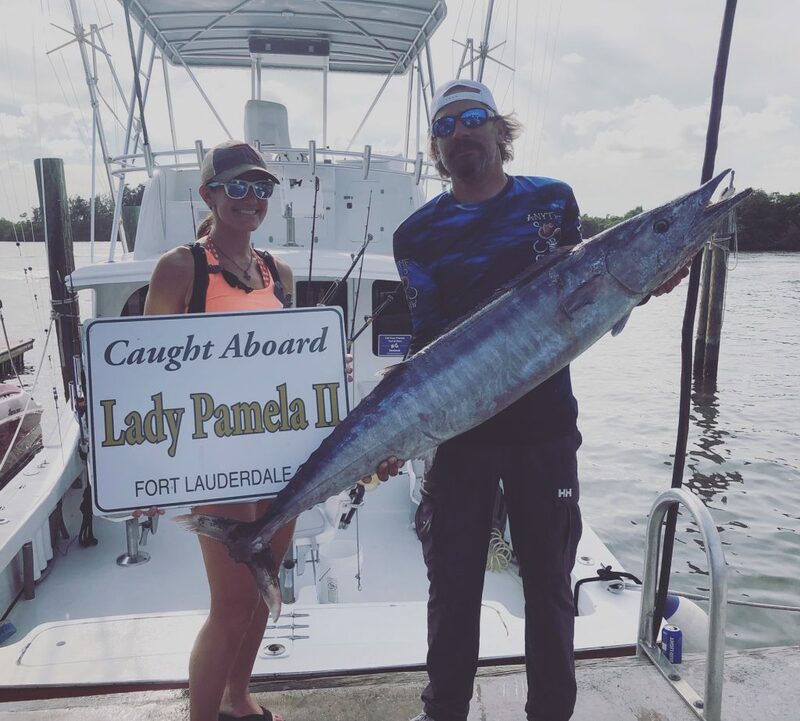 What an unbelievable month we’ve had aboard the Lady Pamela Sportfishing Fleet! 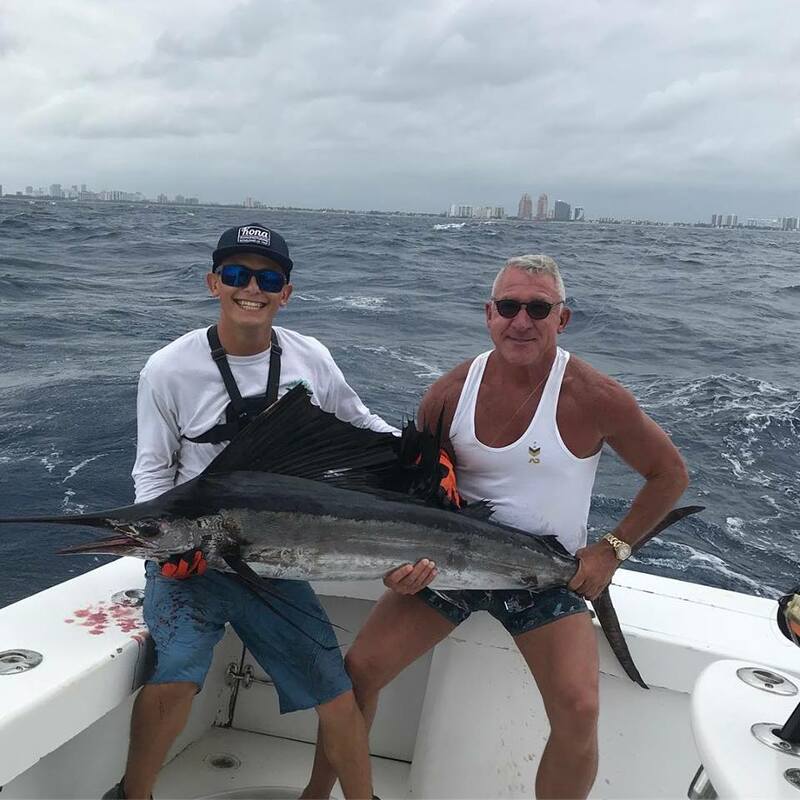 The Spring action is off the charts and we are in the thick of every species you could want: Mahi Mahi, Sailfish, Wahoo, Kingfish, Tunas, Amberjacks, Barrcuda, Sharks and a host of Snapper and Grouper species! NOW is the time to book your saltwater fishing adventure as the Spring action is reaching its PEAK! 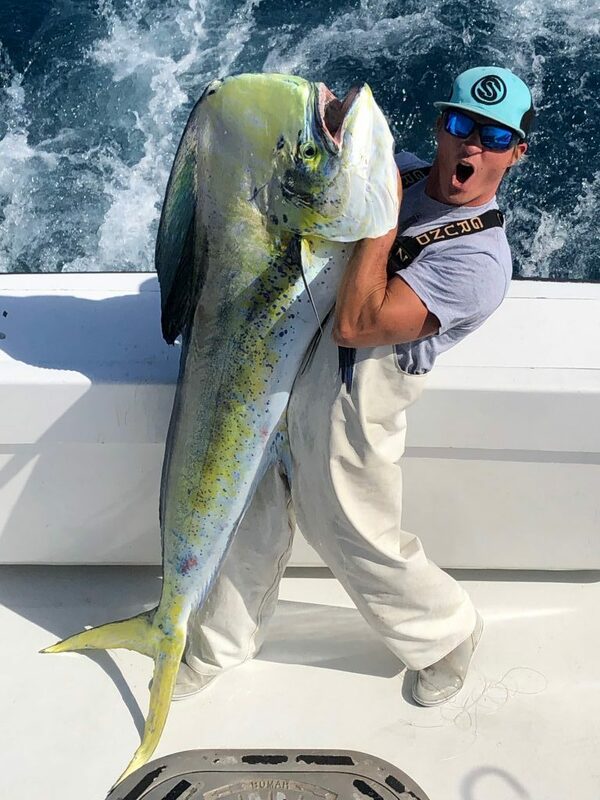 Monstrous Mahi Mahi Caught Aboard the Lady Pamela 2! It was just another day, another adventure for Lady Pamela Sportfishing Captain, Crew and Guest. We headed through the Port Everglades into beautiful cobalt blue seas. There was scattered weed and flying fish for miles. Our goal was to catch a Sailfish. Up went the kites and out went the Goggle Eyes. We immediately caught a Kingfish and got the baits back out. We saw a wake of green and gold come for the Goggle Eye suspended under the kite. The line popped from the clip and we saw this huge Mahi Mahi get about 15 feet of air! Our jaws dropped and the battle was on! It took us 45 minutes to subdue this dayglow chartreuse behemoth. What a team effort by everyone on board. Back at the dock, this mammoth Bull Mahi Mahi weighed in at 72 pounds. We missed the state record by a mere 9 pounds! The Sailfish continue to stay in the area and are feasting on nearly every bait that we throw at them! Our clients have been catching and releasing large numbers of Sailfish as we fish live baits underneath our fishing kites. Kite-fishing is a truly amazing and engaging experience as you get to see the Sailfish AS THEY EAT the bait. Nothing gets the blood pumping like watching a double- or triple-header Sailfish bite up on the surface.We can fish up to three (3) live baits per kite, with at least two (2) kites up at any one time. We’re fishing between 90 and 250 feet of water. We’ve also had luck shallower than 90 feet. When there is not enough wind to keep the kites in the air, we can also slow troll live baits such as Pilchards, Ballyhoo, Blue Runners and Goggle Eyes as well as troll our specially-crafted mullet strips. The “toothy critters” are trying to steal the show -and our baits – from the Mahi Mahi and Sailfish on eavery trip. Leading the pack are some huge Wahoo like the one in the photo below. The Wahoo are crushing our kite baits, slow-trolled live baits and our trolled strips. These are truly world-class catches and we’d love for you to get in on the action! 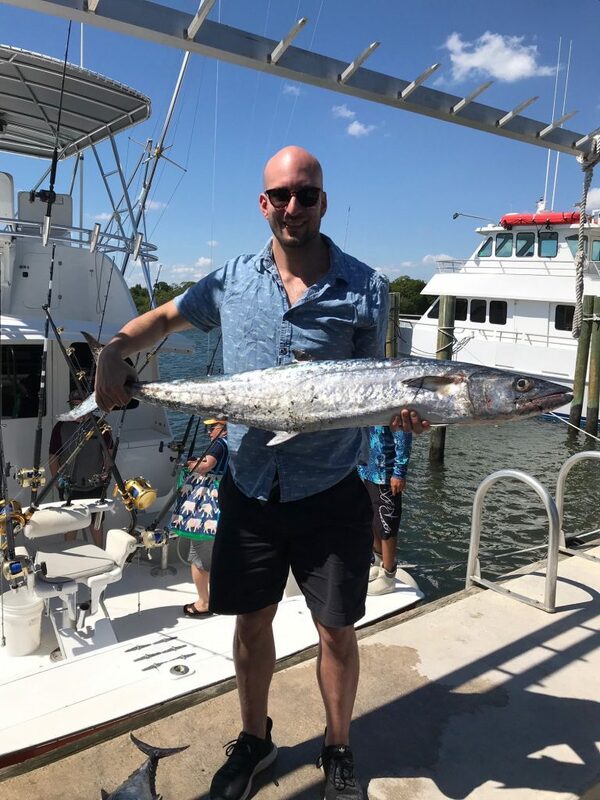 King Mackerel (‘Kingfish”) have been prowling the reefs a little shallower than the Wahoo to pounce on our unwary kite baits and they make for a nice one-two punch with the Wahoo on the outside of the reef. Like Wahoo, Kingfish have teeth that are more like surgical scalpels and they fight hard, which is why we call them “smokers” – they will smoke your drag on scorching runs once they’re hooked. When they’re not crushing our live baits under the kite or slow-trolled, Kingfish have also been responding to our strip baits trolled below the surface on planers along with as Islanders with ballyhoo in both the blue/white and red/black color combinations. We’ve been finding the Kingfish in between 70 and 150 feet of water. The last month has seen a surge in Blackfin Tunas. We’ve been catching Blackfins in the 10 to 15-pound range inside of 120 feet of water on the same live baits under kites as we use when we target Sailfish. We have also caught Blackfins trolling Sea Witches and Bonito Strips at 5 – 6 knots. Large Bonitos are also mixed in with the Blackfins. 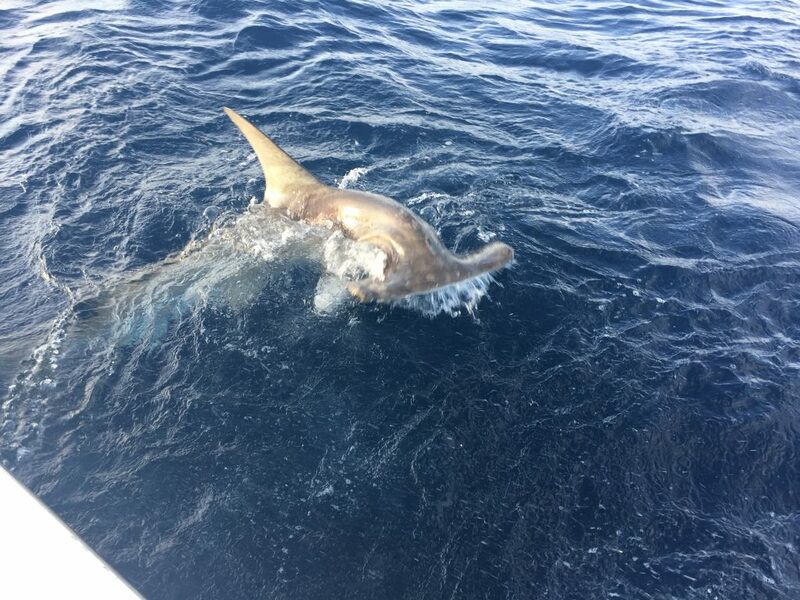 The shark fishing continues to be off-the-charts with big Hammerhead Sharks leading the way! We continue to put clients on other big shark species such as Caribbean Reef Sharks, Blacktips and Silky Sharks. The best shark baits continue to be either a live Bonito or dead Bonito or Kingfish dropped down in 300 feet of water. 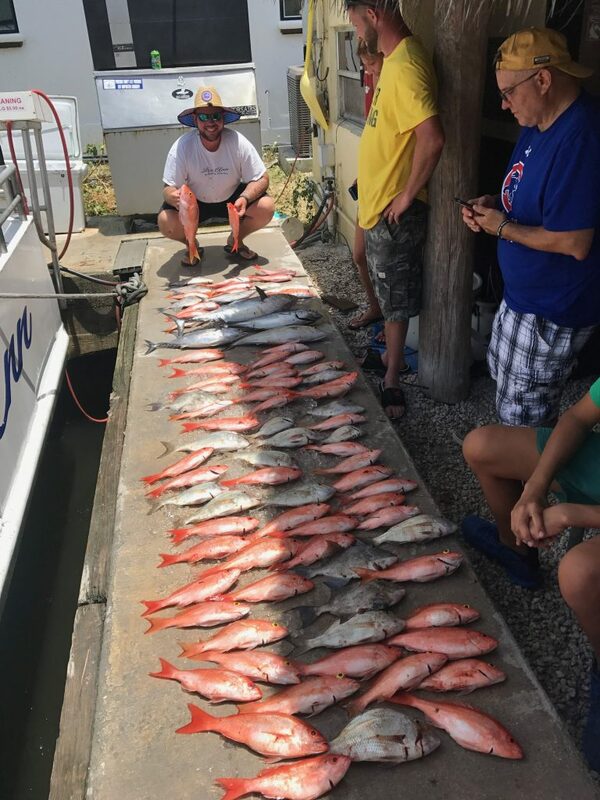 Drift Fishing Report: Waving the Flags! On the Lois Ann, our daily trips – 3 each day – are producing Kingfish, Bonito and a host of Snapper and Grouper. Our nighttime trips have been producing huge numbers of Yellowtail Snappers. Book a trip NOW to get in on this amazing action after the sun goes down. For only $45, come on aboard and test your skill. Remember all ages and experience levels are always welcome. We have a captain and mate on board to help you at all times. Most of the time we want you to catch fish more than you do! Don’t forget about giving the Gift of Fishing to the angler in your family. Give us a call and we’ll take care of everything. Just tell us the denomination of the Gift Certificate. Keep in mind that our Gift Certificates can be honored when booking any of the vessels in the Lady Pamela Sportfishing Fleet! That’s the report for now. Come join us to get in on this stellar offshore action! We need your help to reel in all of these fish! Do you have a large group that wants to go fishing? No problem. We are the only boat in the area that can take more than 6 people on one single boat, so please give us a call as soon as you know your dates.